Wandy do you like Edwin? I sat out 1st round of the playoffs but been playing it ever since. Had Coyotes game 1 and they were just dominated. I can live with myself losing if im on the kings but if i had Coyotes again and lost i would punch myself in the head. Betting against a team you think is better and then losing makes it so much more worse. Kings have been playing great. Crazy to say it but they're probably the hottest topic in my part of LA right now. My brother has a future to win the west and the cup that would pay very nice. Yahoo is such friggin trash. Tells me Berkman is playing so i sit Edwin in favor of him. Berkman sits and a homer wasted on my bench. 3rd time this year Yahoo has bent me over. I was just saying the same thing to someone. Basketball was even worse; they don't tell you anything most of the time. just out of curiosity, what part of LA are you in? South bay, near Long Beach. Obviously Lakers are always a hot topic but I know a lot more people trying to get Kings tickets than Lakers tickets. My dad and brother been going to a lot of the games. Yah the Pyramid is the sports arena for Long Beach State University. I went to school there. 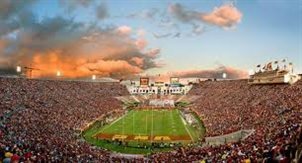 relax usc, its still early in the game.. its gambling buddy, not every night is peaches pal..
Man looks like back to hockey to make up for baseball. Lets go Rangers . Was born on Vandenburg Air Force Base. Pretty sure thats close to you. Nevermind. I was just heard that E5 worked with Cano in the offseason. He'll come runner up to Hamilton in the MVP voting.